• The UK’s largest exhibition of Gothic literature opens at the British Library in Kings Cross on Saturday (4th October), marking the 250th anniversary of the publication of the breakthrough book, Horace Walpole’s The Castle of Otranto. Terror and Wonder: The Gothic Imagination will feature manuscripts and rare and personal editions of Gothic classics like Bram Stoker’s Dracula, Mary Shelley’s Frankenstein, Robert Louis Stevenson’s Strange Case of Dr Jekyll and Mr Hyde and Charles Dickens’ Oliver Twist as well as the work of contemporary writers like Angela Carter and Mervyn Peake. 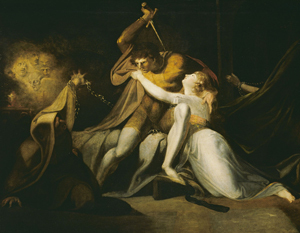 There will also be Gothic-inspired artworks by the likes of Henry Fuseli and William Blake and modern art, photography, costumes and movies by the likes of Chapman Brothers and Stanley Kubrick. A range of literary, film and music events will accompany the exhibition which runs until 20th January. Admission charge applies. For more, see www.bl.uk/whatson/exhibitions/gothic/. PICTURE: Percival Delivering Belisane from the Enchantment of Urma, Henry Fuselli. © Tate. • The founder of the Imperial (now Commonwealth) War Graves Commission, Sir Fabian Ware (1869-1949), has been honoured with an English Heritage blue plaque at his former home in Marylebone. Sir Fabian lived at the early 19th century Grade II-listed terraced house at 14 Wyndham Place between 1911 and 1919. It was during this period that he served with the British Red Cross in France and first began recording the graves of soldiers killed in battle. In 1917, the Imperial War Graves Commission was formed with the task of reburying the war dead in permanent cemeteries in France. Knighted in 1920, Sir Fabian was to be director of graves registration and enquiries at the War Office during World War II and it was at this time that he extended the war graves scheme to civilians killed in the conflict. The commission changed its name to the Commonwealth War Graves Commission in 1960. Today it cares for cemeteries and memorials at 23,000 locations in 153 countries. For more, see www.english-heritage.org.uk/discover/blue-plaques/. • New Year’s Eve in London will be a ticketed event for the first time this year with 100,000 tickets being made available to the public with each costing a £10 administration fee – the entire sum of which will apparently be used to pay for the ticketing system. Making the announcement last month, the Mayor of London, Boris Johnson’s, office, said the growth in numbers of those who have gathered to watch the fireworks on the Thames – from around 100,000 in 2003 to an estimated 500,000 last year – has put an enormous strain on transport and safety infrastructure and meant people have had to turn up earlier and earlier to get a good view, facing hours waiting in cold and cramped conditions, or risk being among the “hundreds of thousands” unable to get a good view or even see the display at all. Booking tickets – people may secure up to four – will guarantee “good views of the celebrations and a better visitor experience”. To book tickets, head to www.london.gov.uk/nye. The Imperial War Graves Commision did a brilliant job, especially for the parents of boys from the far flung parts of the Empire who would never be able to get to France etc. But I thought the system of blue plaques had been terminated, presumly to save money.